China, as the world's second largest economy and the largest developing country, plays a unique and increasingly important role in the G20 as a “coordinator” and “booster," writes Wang Wen, Executive Dean and Professor of the Chongyang Institute for Financial Studies, Renmin University. It is undeniable that China has made great achievements and contribution to the 2019 G20 leader’s summit in Buenos Aires, Argentina. The most important one is the successful meeting between the Chinese and US leaders, which has attracted much attention, and the two sides reached a consensus to stop imposing new tariffs. It shows that the decision makers of the two countries are solving this problem in a rational and objective way. This short-term reconciliation, or "truce" we can say, is a good news for China and the United States, and even for the world as a whole. For China, we can grasp the opportunity to promote the reforms we are carrying more smoothly and be fully prepared for the next 90 days of negotiation. For the world as a whole, this “truce” has restored people's confidence for the development of economy in the future and the stability of the international financial markets. 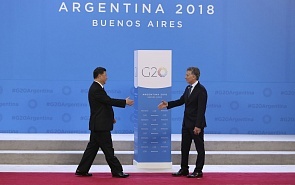 Second, the summit has proved once again that G20 is of great importance in global economic governance and China, as the world's second largest economy and the largest developing country, plays a unique and increasingly important role in the G20 as a "coordinator" and "booster". President Xi Jinping's speech at the G20 Summit concerning the improvement of global economic governance and the healthy development of economic globalization. China’s role aligned with G20’s goals and he mentioned that China is ready to uphold the all-in-the-same-boat spirit to work together with G20 members to surmount whatever difficulty that lies ahead. The “Four-commitment” and "China’s plan" introduced by him has been taken into account in the G20 Leader’s Declaration, including emphasizing that international trade and investment are important engines of growth, innovation, employment and development, and supporting the necessary reforms of the World Trade Organization to enhance its operational effectiveness. All those reflect that China's initiative meets the needs of the world economic development and the common demands of other countries. It is true that the G20 summit points China-US relations in the right direction for the coming period, but China can not be over optimistic. Instead China should realize the fact that there are structural contradictions existing between China and the United States; international trade as well as global governance are facing major challenges; and it is increasingly difficult to reconcile interests among G20 member countries. Issues like how to achieve inclusive, mutually beneficial reforms and what principles should be adapted to guide the work of the G20 require China, the US, Russia and other member countries to take positive actions in accordance with the principles and directions set by them. The G20, after 10 years of development, also needs self-innovation to keep pace with the times, adapt to the new changes in the international economic pattern, and become a public good of global governance which is in line with the trend and needs of the times. Only through collaboration and co-governance featured with consultation can the G20 become a mutually beneficial cooperation platform that can overcome unilateralism and protectionism as well as promote the coordinated development of all countries in the world. In this process, China will make its position clear as a responsible country, taking measures that are beneficial to China and the world. Such as further deepening reform, opening up to the outside world, supporting the multilateral free trade system and paying attention to infrastructure construction in Africa, so as to build a community of shared future for mankind.